When Hermione approached us her confidence and bubble nature really struck us. 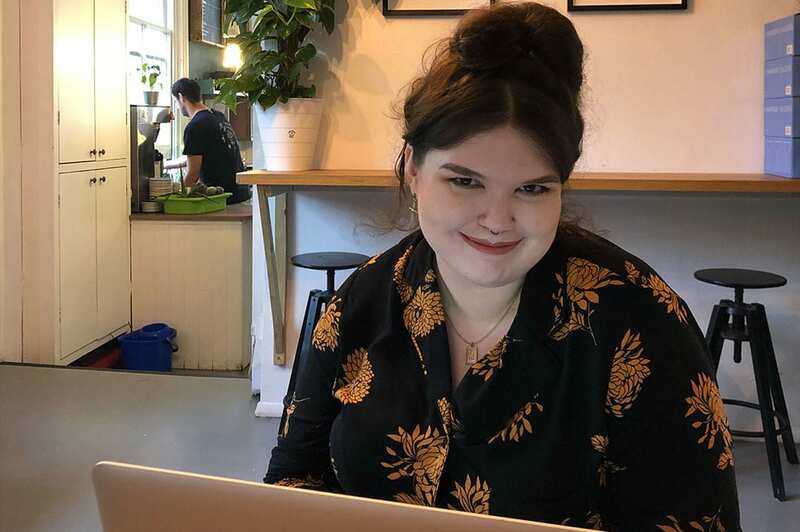 While we couldn’t offer her a role at the moment, we agreed to welcome her for a few days work experience in the office, as a chance to get to know the industry and offer her as many tips as we could about Brighton’s digital sector… Here we asked her to share a few words about her experience. Thanks so much for your efforts Hermione, we have no doubt you will go far! To me, marketing is making sure the clients’ voice is heard over the crowd. It was only through finding Creative Blend that I discovered that you could actually care about who was speaking. I previously worked in Jersey, which is so limited you couldn’t worry about how ethical or eco-friendly a brand or shop was, it was your only option. Moving to a big city, one of the more socially conscious ones in the UK to boot, I was finally given these options. Creative Blend immediately caught my eye when I researched agencies in Brighton and Hove seeking work experience. It wasn’t just because it was a four-minute walk from my flat (although that was definitely a benefit to my lie-in time), it stood out because it prided itself on being an ethical agency. Browsing their website, it was evident just how much they cared about giving back and contributing to the community. It wasn’t just box ticking, it was the basis of their business. How could I not want to be part of that? During my time there I got to witness all the parts of the Creative Blend machine. I got stuck in right away with being part of the digital drop-in sessions, #CBsessions, at Down to Earth Coffee, where free advice was offered to anyone who dropped by. In a way, it was the perfect introduction as it was nice to see I wasn’t the only one who needed a little helping hand in the industry. Researching for clients was something I was familiar with but I’ve never covered such unusual topics as I have at Creative Blend. I’m sure the very niche knowledge I’ve gained will come in handy at some point. Possibly in another pub quiz, another new experience for me as team Creative Blend (or Blendy McBlender) came a respectable fourth place in Search Seven’s charity quiz. To test my new knowledge of ethical marketing, Alex gave me the task of writing a blog post about marketing with meaning and coming up with some ethical questions to pitch local business owners. The suggestion of the book ‘Good is the New Cool; Marketing Like You Give a Damn’ by Afdhel Aziz and Bobby Jones, helped a great deal and gave me better insight into how good is the new cool. I come away from Creative Blend now with a much firmer grasp on the industry and marketing with a conscience. I feel more confident in pursuing a full-time position now I’ve gained a much-needed grasp on how it’s done in the big city. I couldn’t have felt more welcome with them and am very grateful for all they have taught me.